Kelli Griggs from Folsom, California navigated the 419 player field to finish first at the Bicycle's Ladies Event, dubbed the Ladies Poker Party. Being first also means Kelli Griggs is last; the last woman selected for the WPT's Ladies Night IV. Griggs will be matching wits with defending Ladies Night III champion Jennifer Tilly, JJ Liu, Vanessa Rousso, Erica Schoenberg and Anahit Galajian on August 31st. For Kelli Griggs, it wasn't all about getting a televised shot at the pros; it was also getting a chance to play for the cause. Kelli's grandmother died of breast cancer and her aunt is currently fighting that battle. Kelli herself is a four year survivor of Non-Hodgkin's Lymphoma. Ten percent of the prize pool from the event, along with a separate donation from the WPT, went to the Susan G. Komen Breast Cancer Foundation. Kelly also kicked in an additional $2500 from her win. This vivacious young mother of two grew up around cards, but only started to seriously focus on poker in the last year. She credits her brush with a deadly disease as one of the motivating forces in her life. She is a woman that now makes the most of everything she commits to and exerts every effort to achieve her goals. When she committed to poker, she went all-in; reading, playing, and working with a coach. And she is fearless. Her hard work is starting to pay off. Griggs paid for her seat at the 2006 WSOP Ladies Event last month by winning a single table satellite. She parlayed that into a 59th place money finish out of the record field of 1128 players. For the Ladies Poker Party, she said she played a fairly tight tournament until the final table. She did confess to two suckouts during final table play that helped pave the way to her victory. In one case, she felt that she had a solid read on the range of hands her opponent might have based on the previous day's play. And in the other case, when she said when saw she was an underdog, she had a moment like in the movie Matrix where you suddenly realize the bullet can't hit you. Well actually the bullet did hit her, delivering the ace she needed on the river. As you can imagine, Kelli Griggs is pretty pumped up about poker right now. She hasn't slept in four days and was running off to do an interview with her local television station. She has no fear going into Ladies Night IV. The only concern she has is making sure she uses this moment to be a responsible spokesperson for women, poker and cancer awareness. But after talking with Kelli Griggs, I know she's coming up aces on that front as well. Ed Note: Australia is a fantastic place. We have an Aussie Millions freeroll this weekend at Pacific Poker - exclusive to PokerNews.com readers. Sign up today, and we'll see you in Melbourne. 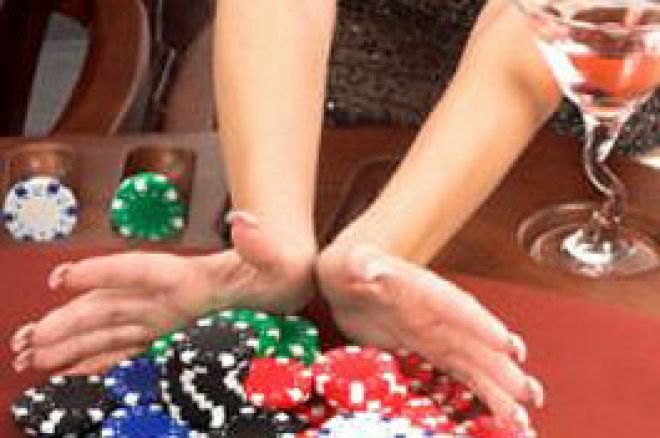 No 'Sophomore Slump' in Poker?